James Shearer, 1951-53. Rectangular-plan World War II cenotaph comprising raised platform with parapet walls to N (raised section bearing names of war dead) and W and 2 flights of steps to S. Austere geometrical design. Coursed stugged rockfaced sandstone with sandstone ashlar dressings, including squared coping. 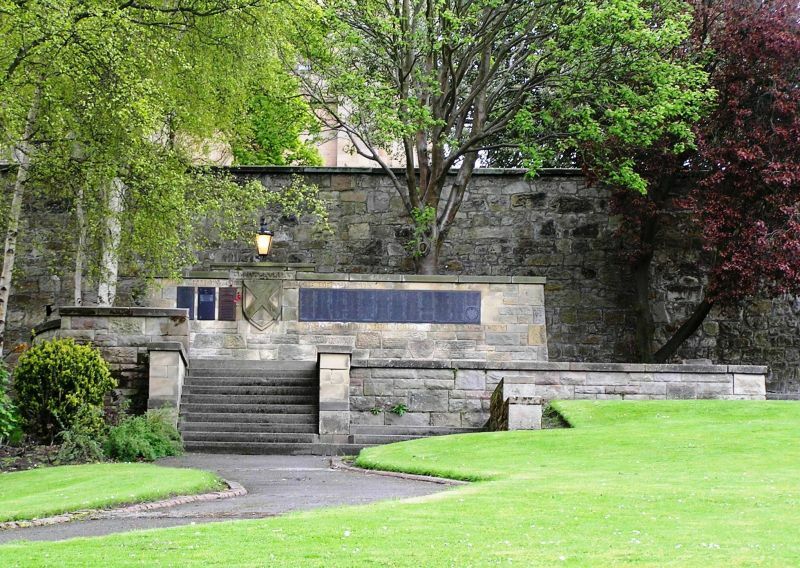 Main focal point is raised parapet wall to N of plaform which is ornamented on S side; shield carved with Scottish flag to left of centre; 'PRO PATRIA' inscribed above; small platform bearing lamp of eternal flame set directly over it. 2 small copper panels bearing names to left of shield; one larger one to right; 'THOSE OF THIS CITY WHO DIED IN THE WORLD WAR 1939-1945' carved into stone above and below. Lower section of parapet wall adjoins to left and continues around platform to steps to left of S side; these are flanked by stepped parapet walls. 2nd set of steps to outer right of platform; these continue at right angles to left along front of platform and turn again at right angles to adjoin 1st set of steps, with projecting stepped parapet wall to outer right.